Come October, some people carve pumpkins; others make yummy pies from the pulp; and a handful of folks (aka grown men in Clay County) hurl them in elaborate fashion during the annual Punkin Chunkin Festival in Hayesville. But if you’re envisioning a Scottish-style hammer throw or Gaelic hurling match, think again. Punkin Chunkin employs all manner of hand-built catapults, medieval-style trebuchets, and even air cannons—some several stories tall—to launch the gourds hundreds, even thousands of feet. 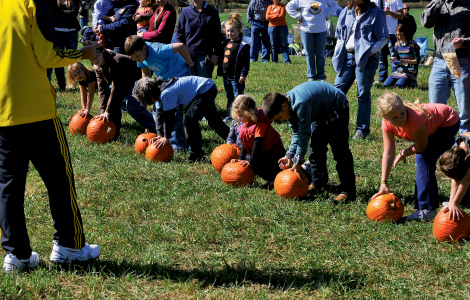 The peculiar sport was hatched in Bridgeville, Delaware, in 1986, when a group of friends held a backyard contest to see who could throw a pumpkin the farthest. The longest distance that year was 126 feet. Nowadays, the town hosts the Punkin Chunkin World Championship every November, which last year drew 20,000 spectators and 72 teams with names like Sister Slinger, Chunk Norris, and Sir Chunk-a-lot. An air cannon holds the current world record for propelling a pumpkin 4,483 feet. Numerous other gourd-hurling competitions have cropped up across the country, including Hayesville’s event. “It’s the cutting edge of redneck technology,” jokes Bob LeKites, the resident expert chunker and creator of WNC’s contest. Now in its fourth year and held on a farm near town, the event sees about a half-dozen teams and spectators from 24 states. The festival surrounding the event offers a chili cook-off, pumpkin pie-eating contest, music, games, and a beer garden on Saturday, and more of the same, plus an Anything Pumpkin Cooking contest on Sunday. The main attraction, when teams line up their siege devices for the toss, takes place in rounds both days. There are categories for various styles of machines and age groups, plus a wild card theatrical class, which is more about making a spectacle. Last year, LeKites team showcased a humorous smoke-and-mirrors act to shrink a pumpkin. “We got a great big ugly trophy for it,” LeKites says laughing. “I’m in it for the fun and camaraderie,” he says, noting that he’d like to see more competitors willing to invest in the foolishness. Machines can cost anywhere from several hundred dollars to tens of thousands, and the winnings include a trophy, bragging rights, and an amusing lesson in physics.